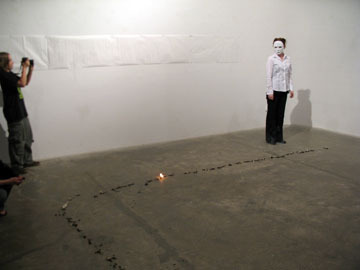 In this poetic performance, my work twisted a concept of "speaking" and "writing" by transforming mediums. It is a curious, cyclical chain of permanence and impermanence of language and medium. 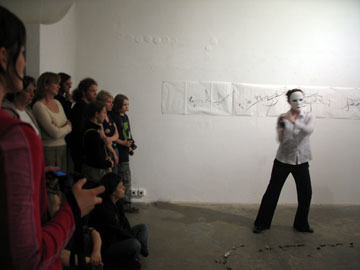 The performance art Unleashed from Phonocentrism was first presented by Jolanta Lapiak at Interakcje: IX Miedzynarodowy Festiwal Sztuki (international performance art festival) at Galeria Bielska BWA in Bielsko-Biala, Poland, on 15 May 2007. Lapiak had her hands handcuffed herself. The first impression might be that it represents an oppression or forbiddance of the use of sign language (signoclasm). That is one side and the other side is that she represents written word in print. Spoken or vocal words, that were flying around in air freely, now feel imprisoned, frozen, and locked in permanence as printed words. She anthromorphized spoken words. Lapiak reversed mechanical words in the form of permanence (in print) back into an organic form and impermanence by burning them. 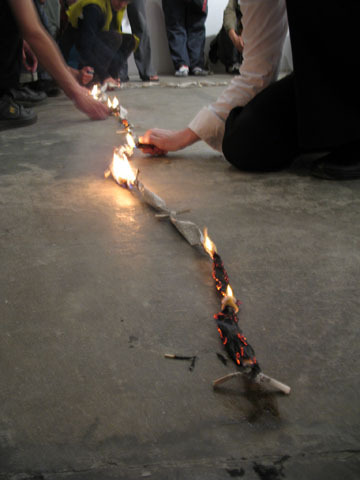 A chain made of the dictionary pages transformed into charchoal-like ashes. She used the charcoal sticks (that represented ashes) to leave a permanent trace of the manually-spoken words (in ASL) on the piece of paper on the wall. 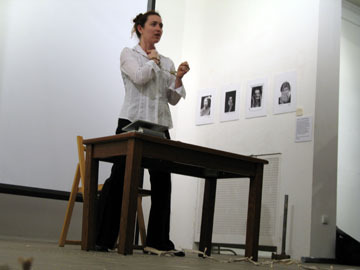 Lapiak transformed 3-dimensional space of sign language into 2-dimensional plane, "manually speaking" her poem in ASL, leaving a trace of ASL movement. Is it a writing and/or a speaking? She refers it to Derridean arche-writing. She repeats the same poem in ASL in 4-dimensional space-time while she had some black charcoal smudges in her hands. As she signed the poem, the charcoal left marks on her parts of the body. 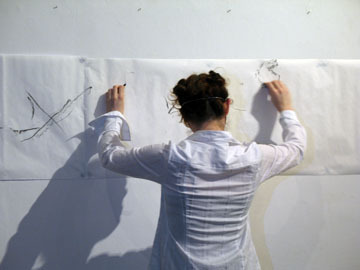 She made it a hinge between writing (on her body as a surface) and speaking (manually). Is it a writing and/or a speaking? She refers it to Derridean arche-writing. Related posts: Liberated from Signoclasm: performance art.